Already more than halfway to their Indiegogo goal, togoDock has received nearly $12,000 of their $20,000 funding goal. This is because developer [FUSE]chicken is working on eliminating the mischievous leprechaun responsible for tangling the cables that you use for charging your smartphone, tablet, or any other gadgets that you need on a daily basis. You know of the leprechaun of which I speak. You neatly wrap your cables and place them in your pocket or bag, only to discover that within minutes they’ve been transformed into a knot that even the Boy Scouts would be proud of. This same leprechaun was formally responsible for tangling your Christmas lights each year, but with the advancement of technology, he’s been promoted. That’s where togoDock comes in. With the use of some heavy-duty magnetics, togoDock creates a leprechaun-free* environment. 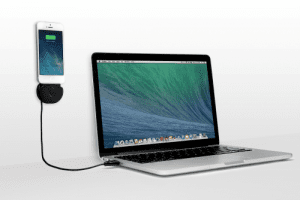 Compatible with most iPhones and iPads (even certain models of iPod Touch & Nano), users will be able to turn nearly any surface into an iOS dock. It works by attaching your iPhone (or other device) to a disc mount which contains a magnet. The magnet can then attach to … things magnets attach to. Suddenly your refrigerator, cubicle wall, wire basket, or the plate in grandpa’s head becomes a place to mount your phone (he won’t mind, trust me). The mount itself is made up of the aforementioned magnet, a backstop, a lightning connector (to attach your device), and a cable wrap designed for easy management. It’s small and light, and for only $30.00 you can claim one for yourself.